POETRY PAGE OF PGR: A passage from "Northern Journey"
A passage from "Northern Journey"
the sad fountain joins our muffled sobbings. dirty, grimy, feet with no socks. topsy-turvy on their coarse cloth jackets. vomiting, runny bowels, several days laid up in bed. to save you from the shakes and shivers of the cold! quilts, coverlets—I’ll lay them all out. my silly girls start in combing their own hair. how ridiculous—drawing eyebrows this wide! and it’s as though I’ve forgotten about hunger and thirst. but who’d have the heart to scold them? Du Fu, the elicitor of superlatives! The Chinese scholar William Hung, who wrote the definitive book in English on Du Fu’s life and poetry, gave it the unequivocal title Tu Fu: China’s Greatest Poet. Professor Stephen Owen of Harvard, the leading American authority on Chinese poetry of the Tang period, enthusiastically seconds Hung’s estimation of Du Fu. And the American poet and translator Kenneth Rexroth, who rendered some of Du Fu’s poems in English, goes a step further to declare him “the greatest non-epic, non-dramatic poet who has survived in any language." A characteristic of Du Fu’s poetry that merits particular notice is his realism. The above passage taken from a long poem titled “Northern Journey,” amply illustrates it. The poem was written in the fall of 757, when Du Fu, having incurred Emperor Suzong’s displeasure, was ordered to leave the court and travel north to Fuzhou, where his wife and children were living. The poem, 140 lines long, shifts back and forth between the political concerns of the entire nation and Du Fu’s private family affairs. The above section, lines 59 to 88, shows us the scene that confronted the poet when, after a long and difficult journey, he finally reached the country house where his family was lodging. 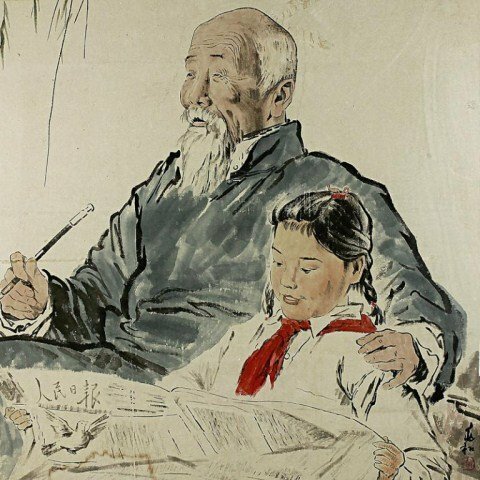 It would appear from the poem that at this time Du Fu had four children, two girls and two boys. The “little boy” in line 5 of my excerpt is probably his younger son, Pony Boy. It seems odd that he should turn away from his father in tears, though perhaps through some misunderstanding he thinks he has done something for which he will be scolded. The “old husband” in line 15 is, of course, Du Fu himself. The whole passage, replete with closely observed details, has two sections of particular note. The first is Du Fu’s description of the clothes worn by the girls, garments that Du Fu’s wife has mended with patches cut from an old and probably expensive piece of embroidery. The embroidery originally depicted a seascape complete with the mythical sea monster called Tian Hu and a purple phoenix or purple phoenixes. But the pattern has now been cut to bits and sewn so that the figures are askew or upside down. The crazy quilt effect that results perfectly reflects the disruption and chaos that have descended on the Du family, and by extension on the whole of Tang China. The second notable section occurs in the latter part, when the little girls, seizing on the powder and mascara that the poet has brought for his wife, proceed to plaster their faces with it. The mood here is all gaiety and madcap humor, a brief moment of brightness before the poem quits the domestic scene and turns to solemn concerns of national policy. Perhaps this is a scene that could transpire in any corner of the world where a father returns home after a war or long absence.